The Joint Opposition said yesterday no money should be spent on luxury vehicle by the government for the ministers’ use till the Meethotamulla victims are fully compensated. Addressing a press conference, former Minister Prof. G.L. 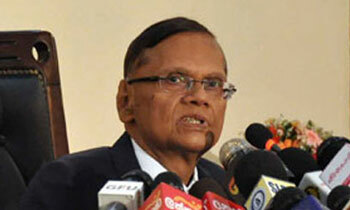 Peiris said 32 persons were killed in the collapse of the Garbage dump and 334 houses damaged. He said the priority should be given to these victims. He said it was a sinful act to spend Rs. 70 million for a minister’s car. He made these remarks following the government’s decision to allocate Rs.1.2 billion for luxury vehicles of ministers. Meanwhile, Prof. Peiris stressed that the government is planning to create additional ministerial portfolios and has allocated Rs. 43 million to purchase vehicles. “We see the difference between the promises and deeds. Is this Yahapalanaya?” he asked. Even now your master has imported a DUTY FREE super luxury vehicle !!!! What vehicle do you use to go around ? This coming from a guy that hopped from country to country on the public dime and have nothing to show for it. Probably GL has forgotten how much he enjoyed when MR was in force. Where was his voice then? ?